We can provide this Stenter Machine as per the customers need. Riding on unfathomable volumes of industrial expertise, we are engaged in manufacturing a broad assortment of Infeed Device. We have a wider width hot air stenter for Heat setting, and stentering of Polyester and Cotton knitted fabrics with Spandex and Lycra. the stenter is equipped with Mahlo weft straightener to process striped fabrics. 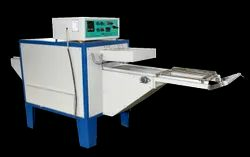 Dhall stenter machine working width of fabric up to 3600mm & suitable to run on Gas, Steam or oil. We are highly acclaimed in this industry for providing an optimum quality range of Open Stenter Machine. Stenter machine motex twin-air model 2003 with batching working width 1800 mm 6 chamber with ac drive on main motor , mangle motor, overfeed motor and pinon motor. We manufacture an elaborate range of mini Batching Stenter Machine to our clients. These can be customized according to our clients needs. We offer reliable hot air stenter machines with working width of 600mm to 300mm. 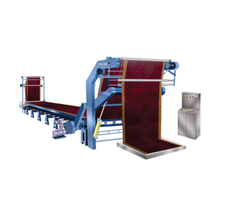 We provide latest technology textile machines. We offer high speed, heat setting & finishing pin-clip/pin-type hot air systems. Our range of machines are durable and reliable. These machines are available at very reasonable prices. Our company has sculpted a remarkable place in the market as a reputed manufacturer of Batching Stenter Machine.